The name Ron Johnson (R-Wisconsin) probably doesn’t mean much to the average voter in Virginia. But U.S. Senate candidate George Allen (R) wasn’t necessarily looking to impress the “average” voter when he announced Johnson’s support of his campaign and then brought him on the stump with him Friday in Richmond. Johnson is a wealthy businessman who ran a largely self-financed campaign to sweep long time liberal Senator Russ Feingold (D-Wisconsin) from office. Johnson received a great deal of support from the Tea Party and is happy to be associated with the movement. A fiscal deficit hawk, Johnson supports deep spending cuts and is strongly opposed to the health care reform act and the federal stimulus. Allen has a lukewarm connection with tea partiers in Virginia. One of the most prominent tea party leaders in the Commonwealth, Chesterfield’s Jamie Radtke decided to run against him in the upcoming republican primary. He has had a mixed success appealing to local tea party groups as he looks to seal up the nomination. Allen rarely appeals directly to the tea party but once said he was an “original member” of the tea party. Allen’s biggest problem with the Tea Party comes from his last time in the Senate. Six years of supporting largely Republican led proposals that bumped up the federal debt and is a period of time that hard-core Tea Party members are very critical of. Johnson’s visit to Virginia it allowed his critics to remind voters about that time in office. Both Radtke on the right and the democrats on the left were all to eager to dredge up the past. Radtke released a very critical web video that called Allen out for his support for “40,000 earmarks”. Web videos rarely have widespread appeal, but Radkte got a big bump when PolitiFact Virginia chose to rate the claim. Their “mostly true” rating pushed the video to a much wider audience. (It was in our PolitiFact Virginia report this week on NBC12). Democrats meanwhile had a field day pointing out the mixed message Allen has had with earmarks, saying he was “proud” of the ones he had brought back to Virginia and said they were ok, as long as they were accompanied by detailed information as to who proposed them. 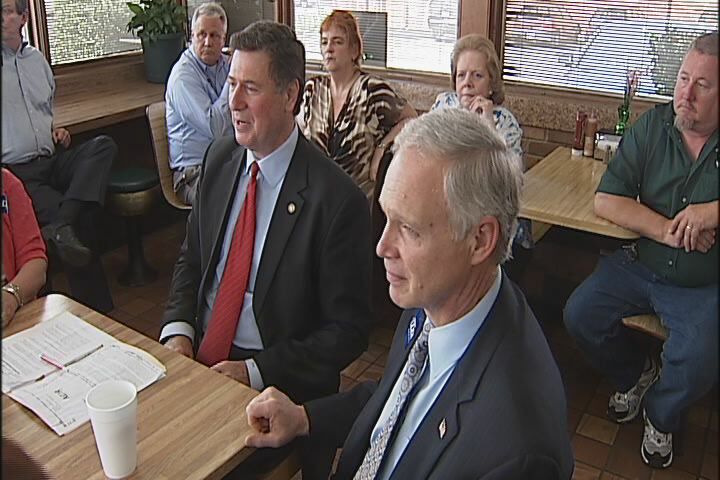 Johnson worked to rein in the criticism of Allen in event today at Bill’s BBQ in Richmond. He strongly supported the former governor and senator’s leadership skills. Johnson argued that while progress is being made in Washington, real change hasn’t occurred because the Congress needs more people with Allen’s experience and ability to bring people together. He also said that Allen’s first go around in Washington was much different than things are now. Despite the lack of rousing support from the Tea Party, there is simply no evidence that Allen is suffering. The few polls taken on the GOP primary show him with very large leads and he is neck and neck with his democratic opponent Tim Kaine in just about every poll. It is clear that Allen’s effort to reach out to that wing of the party is subtle. When we asked him about what role they will play in his election, he said they were important but went out of his way not to single them out. This won’t be the end of Allen’s effort and it will likely continue beyond the primary. The Republican nominee, no matter who they may be, will want the passionate support of the Tea Party to help push them over the hump come November in what is destined to be a razor thin election. He was making a point about Donald Trump, but the figure Terry McAuliffe threw out about U.S. debt owed to China caught the eye of the truth seekers at PolitiFact Virginia. Here is this week’s PolitiFact Virginia report. Any true rating is welcome news to a man hoping to run for governor once again. You can see all the details behind the report at PolitiFactVirginia.com . 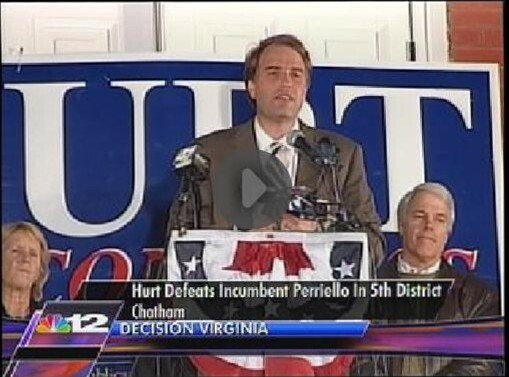 Congressman-Elect Robert Hurt is not backing down. He still believes that the Federal Health Care Act is an example of a “government takeover” of health care. Hurt and many other Republican candidates and politicians were tagged by PolitiFact with the “lie of the year” because of this claim. Hurt has help in his fight against PolitiFact. In a rare move, the Wall Street Journal editorial board wrote a scathing column hammering the media outlets that support PolitiFact. The Journal claims that PolitiFact went too far criticizing politicians who dubbed health care reform a government takeover and spelled out the reasons why they believe the Republican argument has merit. In part the Journal points out how the Obama administration is using the PolitiFact report, (which was the national outlet’s “lie of the year”) to defend the plan and attack the GOP for questioning it. Their editorial board believes that PolitiFact is not the final word on health care debate and even questions the objectivity of the reporters who contribute to the program. PolitiFiction: True ‘lies’ about ObamaCare. Hurt’s team is now using the Journal editorial to defend his statement. Which side do you come out on? Chances are with much of today’s political debate (especially this issue) the answer probably hinges on where you stand on the issue. During his campaign for Governor, Bob McDonnell made it very clear that he would not force State Employees to contribute to their pension plans. He spelled out that committment with a very direct statement on his campaign web site. But as he looks to balance the state’s budget, the situation with the state’s pension plan has gone from bad to worse. Without raising taxes, McDonnell has only one place to go to make the pension system solvent, the employees themselves. That is why he has proposed a plan to force employees to contribute 5% of their salaries to their pensions. The contribution would be offset with a 3% raise, but overall employees will see a 2% drop in their take home pay. The reporters at the Richmond Times-Dispatch determined that this moves is a “full-flop” from McDonnell. You can read their entire report on PolitiFactVirginia.com. The Speaker of the House of Delegates William Howell is under the microscope this week in our PolitiFact Virginia report. During an appearance on “Freedom and Prosperity” Radio, Howell asserted that the Federal Government was making plans to force Americans to role private retirement over to the government to protect social security. PolitiFact investigated that claim and found Howell’s assertion was so far off that his “pants are on fire”. You can see their full report by clicking here.